About as classy looking as one can get for a rainbow LED gaming keyboard :D I love the simple styling and lack of extra buttons, and dig the volume roller and media control keys. Typing is nice, and it's super awesome with supported game. Things like flashing med kit key when low on health in The Division, the keyboard goes bright orange when you are in the middle of an exploding napalm factory, etc... super cool. Has the The Division game code. CANT SYNC WITH MUSIC too bad. A decent upgrade from my old Razer Chroma, but typing isn't as enjoyable with it. Fans of Cherry Switches, will like the alternative ROMER-G's. 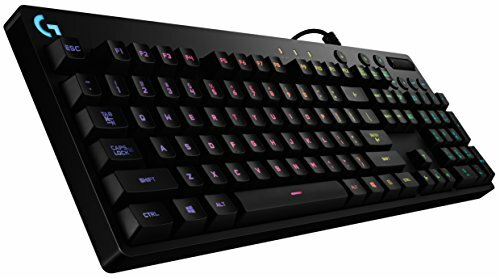 Honestly, I don't feel much a difference between different kinds of switches, but after using this keyboard for months I don't know where I'd be if I couldn't program different modes and lighting patterns/groups for macros while editing or playing games. The software is easy to use and the keyboard is easy to clean and responsive! Can't go wrong if you're thinking of purchasing this keyboard. from completed build Woo! First Build! I really like the minimalist approach. The keyboard doesn't do anything too fancy but still seems to support some useful (yet to be explored) features. This is one of my first mechanical keyboards since coming back to PC gaming, it's very well built the Romer-G key switches feel great compared to blue keys. Amazing keyboard. So much customization and great ergonomics. Screw Cherry switches! Romer-G is where it's at. ROMER-G FTW! Love the minimalistic look. Doesn't give off the "gaming" keyboard vibe, but definitely performs as such. Switches on this are great. Need to get a wrist support though. Really starting to like it a lot the more I play CS GO with it.